Pour Over - Utopian Coffee Co.
Brewing coffee at home can often be a challenge for people; a challenge that leaves them wondering why they can’t get it to be as good as the coffee shop. A lot of that is due to the tools (equipment) the specialty coffee shops are using and we’re going to talk about a way that you can make a great cup of coffee with a pretty simple method. Grinding fresh and using an accurate amount of specialty coffee and water makes a huge difference! However, there is a final step you may choose to take if you wish to greatly elevate your personal coffee experience. 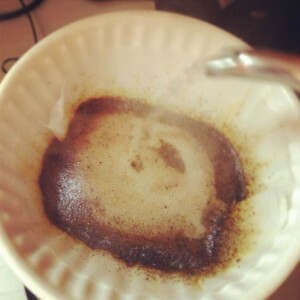 This final step is the manual brew method, such as the French press or pour over. The reason most people switch to the manual methods is that you have more control over water temperature and water flow; a few of the manageable variables that make great coffee. Let’s focus on temperature for now. Water acts as a solvent to coffee by “washing” the flavor out of the coffee grounds and happens to be a better solvent at near-boiling temperatures. 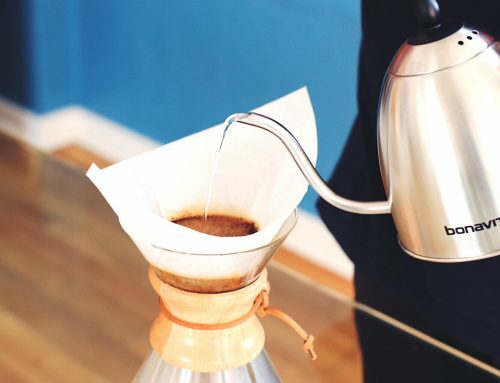 Brewing with water that is between 195 – 205 degrees has been found to work best, so as to not burn the coffee while still extracting the best flavors from the coffee grounds (lower temperatures will not extract the full flavor). The problem is that most home brewers cannot reach this temperature and the ones that can cost $100 or more. 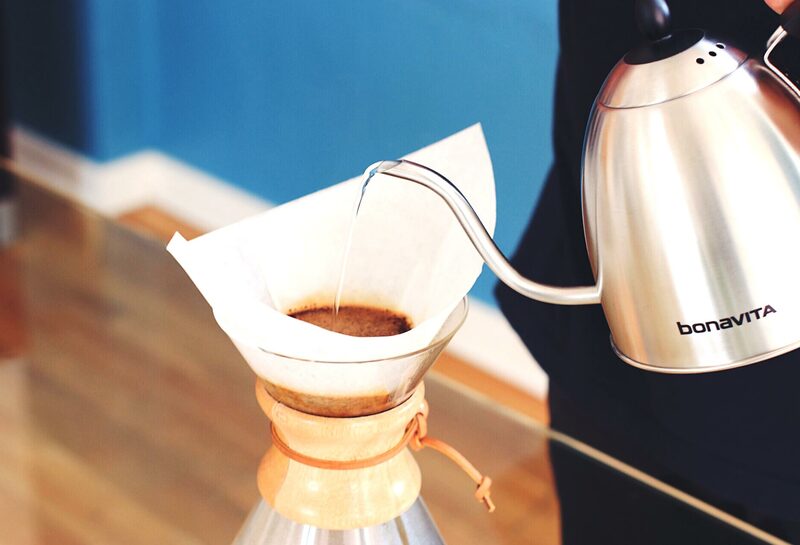 This is a huge factor in coffee quality that can easily be controlled through manual brewing. Next, we have water flow. A lot of brewers just spit the hot water onto the bed of coffee sporadically, leaving some parts of the coffee bed completely dry! As you can imagine, this results in a very poor pot of coffee, a problem easily corrected by manually pouring the hot water over the coffee bed yourself. One simple solution to all this is to brew with a pour over filter cone. Using water just off the boil (about 200 degrees F), add a small amount of water to wet all the grounds and let the coffee “bloom” or rise. Wait 30 seconds, then start to pour the rest of the water slowly from the center of the grounds outward, in a circular motion. As the coffee begins to filter downward, a slow, even pour helps draw out infusion time to maintain the thermal mass of the coffee/water mixture. Total brew time should be about two and a half minutes. 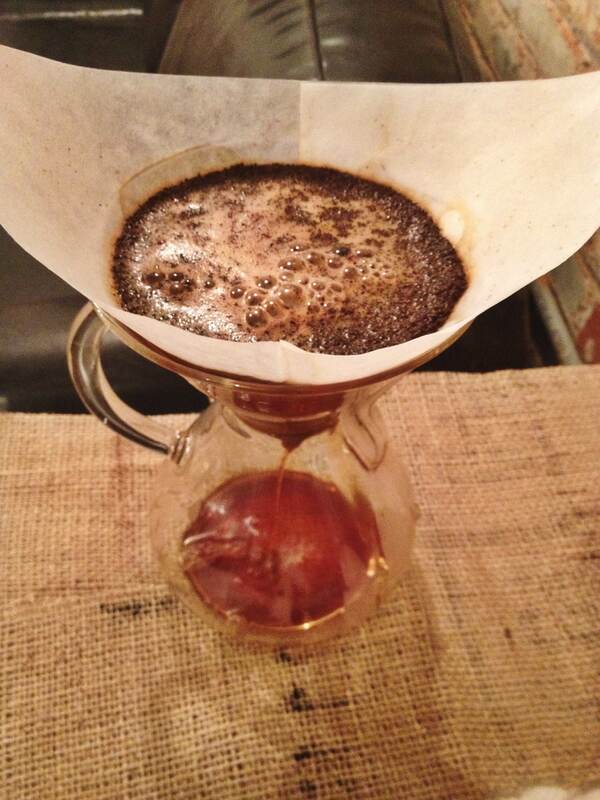 We sell the Chemex 8-cup Pour Over pot in our shop. Drink deeply…and enjoy!